David (Mark Boone Junior) is a delivery driver who suffers some kind of brain damage after an accident. His girlfriend (wife? I'm not really sure) Delia (Melora Walters) has tried to be there for him, but his increasingly bizarre behavior is just too much for her, and she decides to leave him. David can't understand why, and after his attempts to win her back using more traditional methods such as apologies and gifts fail, he comes up with a bizarre plan to teach himself how love works so that he can use those lessons to fix his own broken relationship. David's plan involves kidnapping a couple of lonely young people he knows from his delivery route and trying to force them to fall in love. . The two abductees both live in the same apartment complex as each other and David, but until now have been largely unaware of each other. Daylen (Daniel Hassel) is sort of an indie rock slacker type who works as a security guard. Maggie (Taylor Engel) is a grocery store clerk who comes from a troubled family situation. Despite the unusual circumstances of their meeting, the two genuinely start to hit it off. Still, it's uncertain just how serious David's mental illness is or how dangerous this game could get. It's a pretty bizarre premise that could easily feel contrived, but writer/director Kenton Bartlett manages to sell it. 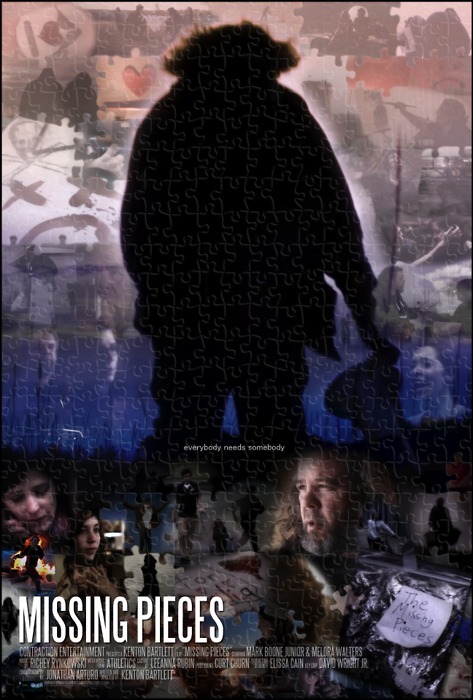 For a low budget movie on which most of the cast and crew worked for free, MISSING PIECES looks amazingly professional. A good bit of the credit for that has to go to Jonathan Arturo's beautiful cinematography. Having such a strong cast certainly helped, as well. Hassel and Engel act awfully calm for being in such a tense situation, but they make us believe that's how their characters would behave. More importantly, we believe these two when they start to connect with each other. It's also great to see Boone, a fine character actor probably best known for playing Bobby Elvis on the Sons of Anarchy television series, in the spotlight for a change. Guys who look like Boone rarely get leading roles in, and he makes the most of the opportunity. I'm also a big Melora Walters fan, but sadly she isn't given that much to do here. Thematically, the film seems to be saying that people are often so absorbed in their own problems that they fail to see potential happiness right in front of them. At the same time, it also points out that love isn't something that can be reduced to a simple formula, no matter how closely you study it. Despite the inherent creepiness of the situation from which they spring, these messages make it through in a way that's not creepy or dark at all. 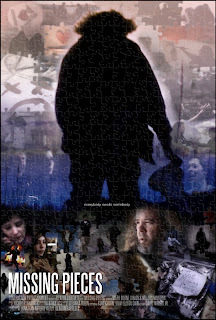 Bartlett allows his story to unfold in a jagged, nonlinear fashion, no doubt to mirror David's mental state. I don't necessarily mind that approach, but in this case I'm not sure it really added anything to the film. The main problem, though, is that MISSING PIECES gives us both too many pieces, and not enough. As it is, the film feels too long, and the pacing is glacial. There's far too much time spent on backstory for Daylen and Maggie. Some of that could have been left out or delivered more economically. At the same time, we see nothing of David and Delia in their happier days, which might have helped give us a little more empathy for David's plight as well as giving the film's somber tone a chance to lighten up for a moment or two. Still, for a first feature from a director who was only 21 when he started filming, it's quite an achievement. 2 1/2 out of 4 stars.